In this body of work I am looking at food, pomegranates specifically, and various ways they can be depicted through print media. The pomegranate fruit is as rich with symbolic references as it is visually beautiful and complex. Some scholars have even gone so far as to suggest that the pomegranate rather than the apple was the fruit of the tree of life from which Eve tempted Adam. Pomegranates and food in general have been prevalent in art throughout history, serving as a means for survival, and also as a vehicle for religious symbolism, the transience of life, mass consumerism, and other metaphoric references. In my work I have looked at food in a textual way; mainly through the choices and reasons by which people eat certain foods and the strategies behind how they eat them. In this series I am working with some of these ideas in a purely visual way through the medium of print. Print media and pomegranates seem to be far-removed comparators, but there are inherent qualities that they both share. Like print making, pomegranates are process-oriented fruits: they are complex and time consuming to prepare; they are not necessarily an immediate fruit when compared to an apple that can be eaten off the tree; they also stain and leave their mark on whatever surface they touch; and, in the end, they exist in multiplicity. 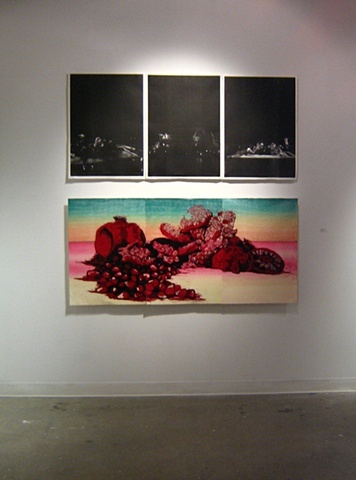 This work consists of three components; a large scale micro-mural, a still life triptych depicting three ways of opening a pomegranate, and an artist book that consolidates the above mentioned prints into miniature form, specifically in the convention of the "Easy Open" grocery store brochure (images of artist book soon to come). Installation viewof pieces within in this body of work (displayed in "Hard Pressed" at the Special Projects Art Gallery).